We received our holy cards in time to distribute at our wedding. We are very pleased with the quality. Thank you for your time and efforts to accommodate us on such short notice. Hello....I want to thank you for sending me the beautiful Holy Cards I ordered! They are of perfect size and colorful, wonderful prayer/backs and a blessing for the Church! For many years I have mailed Catholic Sacramentals all over the world to (mostly) less fortunate Catholics who are thrilled to receive tangible bits of our Faith....I hope to be able to place a larger order soon for more mailings.....Thank you and be blessed to continue your work! Received my order today and to say the least I am extremely pleased with the custom Holy Cards for the Year of the Priest. I know that the Knights will like them and that our Priests and Bishop will feel honored. Thanks for all your help and the great quality of your product. I will definitely show these at our State Kick off meeting. [Received the custom holy cards] they're beautiful & HOLY!!!! Thank you for your ministry of wonderful, loving service and quality products. Our staff is very excited to give these to our parishioners - they will love them. Just wanted to let you know the cards arrived yesterday and they are beautiful. Everyone here at the office loved them. They will be given to all those who attend Bishop’s Mass this Sunday. Thank you for your addition to what we know will be a wonderful celebration. I just wanted to let you know that I am so pleased with the prayer cards you made for my upcoming wedding. They are just beautiful! Their quality exceeded my expectations, and I'm so thankful that you are making these cards available to all who need them. Your call to this ministry is inspiring! Yesterday, we received our prayer cards for our sons wedding .They are perfect. The bigger size turned out great. We are very happy with them and I am sure our son and daughter in-law to be will be happy with them also. We plan on giving the prayer cards to them at their rehearsal dinner the night before the wedding. Once again you have produced an outstanding product and provided excellent service. Thank you and your team. The prayer cards arrived and they are perfect! Thank you so much for all of your efforts, the quality of the prayer cards and the efficiency in having them arrive on time! Our family appreciates it very much! I just wanted to take a moment and tell you how very beautiful your prayer cards are and how much our parishioners have appreciated them! I volunteer answering the phone at St Joseph Catholic Church here in Bowling Green, KY and when I began my little 'ministry of the phone' in January, I noticed how depleted our selection was. About a month ago, we began receiving requests for some unusual cards which I could not find in our church supply catalogs [St Jerome, St Peter Claver, St Augustine]. I went home one Friday night and after doing a search came upon your cards. What a blessing to find such an unusual and artistic selection! I just wanted to thank you for my recent order...the prayer cards you sent were exquisite. Thank you for your thoughtfulness and service. I received the prayer cards today. I would like to thank you again for your helpful service. We appreciate your ministry and pray that God continue to bless your ministry. The other seminarians were very happy to see the prayer cards turned out so well! I just wanted to shoot you an e-mail to thank you so much for the beautiful holy cards you made for our wedding! They were very professional, brightly colored, and creatively designed. The holy cards were the subject of many positive compliments at our wedding and provided us with a budget-friendly way to witness to our guests. They also were perfect to send with thank you cards to people who could not attend the wedding but wanted to be there and share in that experience with us. Again, thank you for being such a wonderful company and ministry to work with. I have and will continue to recommend you to others! We received our prayer cards today - much to my surprise! I wasn't expecting them until next week. And, then I opened the box and cried............with tears of joy! The cards are stunning...high quality, perfect in every way. We are not only prepared well ahead of time for our Feast Day, but we're also able to give them as a special gift to our Confirmation students on retreat this weekend. They'll use them at Mass and have them as reminders of the parish and of their retreat. Thank you for your outstanding service and high quality product. May God continue to bless your work to make the world a holy place! Just a note to let you know that we received our prayer cards today and we are very pleased with them. They are lovely and we look forward to distributing them to our parishioners. We highly endorse your prayer cards and we really appreciated your wonderful service. We appreciated the time and the consideration given to our order. Thanks and may you have a blessed day. You printed the holy cards with St. Rose of Lima for our wedding. They turned out wonderfully and we were really thrilled with them. We loved inviting our guests to pray with us and for us on the wedding day and beyond! We received our customized prayer cards a few days ago. They are perfect, we are very impressed with the high quality finish. They are exactly what we wanted and we are very excited to give them to all our guests at our wedding. The prayer cards are absolutely beautiful! You have quite a talent-thank you for sharing it. I can't say for sure, but I am anticipating that we will give out those cards quickly and may need more! It truly has been a pleasure doing business with someone who cares about his customer's preferences. I was beginning to think that was a lost art. God bless you, yours and your business! The holy cards arrived last week and you guys are GREAT!! I am so pleased with the product. Thank you again and I will be sure to recommend you to my friends! The cards were just beautiful, excellent quality, we were so pleased with them, better than anything we could have bought in a store because they were personalized with our own favorite prayer, and personal info. Also, as said the customer service was excellent. I want to tell you how thrilled I am with the prayer cards. They are so much more then I expected!! The quality is just fantastic. With ordering them sight unseen and over the internet I was nervous about what I was doing, but when they came I wanted to cry because they were so much more then I was hoping for. My son was impressed. Thank you for your patience and your detail to your work. We just received the Divine Mercy cards today and they are truly fantastic. We are very pleased and we will be very proud to give them to our priest as a gift. We will definitely come to you in the future with similar needs and we will recommend you to others, to be sure. It really is a blessing in this day and age to have access to the type of technology that gives regular folks the opportunity to create a prayer card that has personal meaning and can focus on a particular intention and devotion. It is affordable, professional, and indeed a way to spread God's love to others. We are very grateful for having found your service. Take care and God bless you, and your family, and this ministry! Thank you so very much for donating your prayer cards to our "Helping Hands Medical Mission / Ghana" again this year. We truly appreciate your kindness and generosity. May God bless you and those you love. 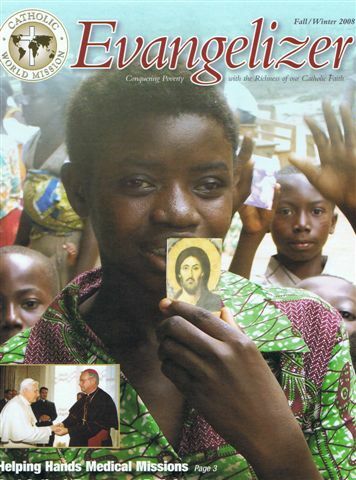 Here is a picture of the Catholic World Mission magazine. Please note the prayer cards that these dear souls are holding are just a few of the millions that we had donated to the missions over the years. I would like to thank you for the beautiful novena prayer cards to St. Raphael you sent me. They arrived on time and are absolutely beautiful! The artwork is gorgeous and the paper stock quality is A+! Best of all, you willingly worked with my tight budget. May God bless you, your family and your ministry for this important and holy work you are doing in God's vineyard.